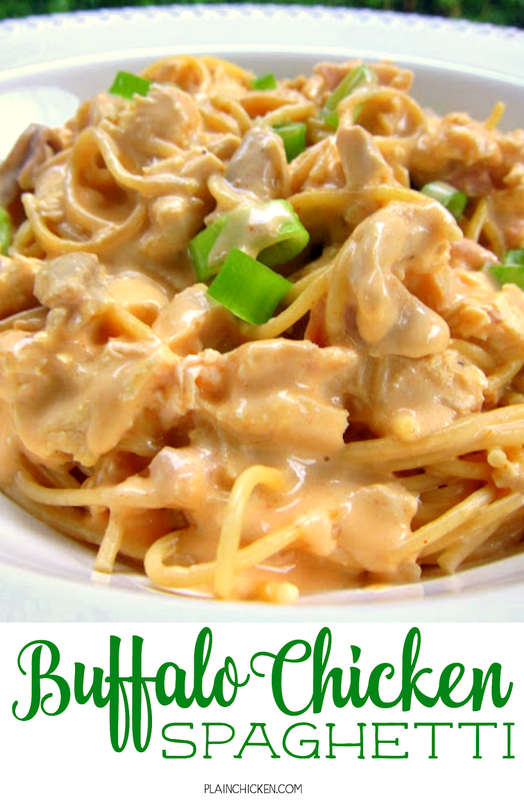 Buffalo Chicken Spaghetti Recipe - chicken and spaghetti tossed in a cream cheese, buffalo, cheddar and Ranch sauce - OMG! SO good. I wanted to lick the plate! This might be my new favorite pasta dish. It combined two of my favorite dishes - buffalo chicken dip and pasta. I used a rotiserrie chicken and it came together in no time. The hardest part of this recipe is boiling the pasta. We absolutely loved the flavors in this dish. This does have a nice kick to it. Feel free to adjust the hot sauce to your desired level of heat. I like spicy food, so I went for the full 1/2 cup. We topped the pasta with some green onions for color and a little crunch. Give this a try. I promise you won't be disappointed. In a large sauce pan, combine chicken broth, cream cheese, hot sauce, cheddar cheese and Ranch. Stir until cream cheese is melted and sauce is warm. Add chicken and toss with spaghetti. Serve with green onions and more cheddar cheese if desired. Oh my gosh this looks so sinfully good! So quick, easy and flavourful! Love this for a quick and tasty dinner idea! Sorry - I have never heard of "Frank's Hot Sauce". Can you help me out? I usually find it on the top shelf in the Ketchup section of the grocer. But go for Franks "Buffalo" Sauce - very flavorful. The "Hot" is too hot and heavy. Love all your recipes and I would weigh 500lbs if I lived with you!! !Great uncomplicated recipes! Another one I'll be Pinning and making very soon! How many People will this serve (salad and garlic bread and dessert will be served -- young adults)?? This would easily serve 6-8 people. I would say 8 with salad and bread and dessert. Gail - Frank's hot sauce is a thicker type of hot sauce used on buffalo chicken wings. It will be near the ketchup and regular hot sauce at the grocery store. I made this last night and it was wonderful! I was a little afraid of the hot sauce, so I used sparingly, and it was just the right amount. It was also great as leftovers tonight, I threw in a chopped up tomato to give the leftovers a little more liquid. Andrea - YAY! I'm so happy to hear you are loving all the recipes! Can you clarify what shape of the chedar cheese to use? Looking to make this ahead of time and reheat for dinner a couple nights later. Anyone reheated it? Has anyone made this in advance and served later?